280 pages. 248 x 170 mm. It is an undeniable fact that most modern working dogs are inferior to their illustrious ancestors. However, this unique handbook seems certain to help remedy this state of affairs. Written from the perspective of the professional Australian stockman, it examines and illuminates every aspect of the high-quality working dog. Working Sheep Dogs provides the most detailed and unique discussion of the principles behind the training of working dogs ever published. It reveals little known methods and secrets for training and handling dogs in the most effortless manner. Also, and perhaps most importantly, the author undertakes the ambitious task of providing the first and only comprehensive breakdown and analysis of the instincts of the working dog, and goes on to discuss various principles and methods of their breeding. Also included are chapters on sheep dog trials and their judging methods and shortcomings, and why and how these need to be modified in order to encourage the breeding of better dogs. In short, no working dog owner, breeder, or trainer can afford to be without it. THE book I’ve been needing for years…my BOOK OF BOOKS! Finally I've found THE book I've been needing for years! I am really starting to understand in detail what herding instinct and ability really means, how sheep behave as a group of prey animals, and how to think about sheepdog training and especially breeding. This remains my BOOK OF BOOKS in my brand new shepherd's life! My very favorite herding how-to book. This book will teach you all the traits a dog should have without being trained. It will let you be able to pick a pup from a litter that has a good temperament. I give this book a five star rating. Anyone serious about breeding and/or training better dogs must get this book. A treasure of great information. You won't regret buying this book. Hi Tully, I purchased your book just prior to picking up my Kelpie, she is now just over 2 years old. I work in the city and to this day I still carry your book in my bag and most days I will flick through different chapters and it's amazing how things spring into your head when a mistake is made I ask myself "what would Tully say". I just cannot thank you enough for a book that can be read by the most experienced handler or the complete novice like me and learn. This book should be like pedigree papers and given to everybody to read it as there is real information in that book that will help regardless of your experience. A mate of mine has a copy and often we find ourselves asking questions when something goes wrong, we always refer back to the "Tully bible". I hope I am not bothering you but just want you to know what your book has done to us." In my opinion this is the finest book written on the selection, breeding, training and handling of working dogs. It has been written by a very knowledgeable person with a great deal of passion to breed and train good working dogs – Tully Williams. I came across this book which was advertised on the CSIRO web site, and since I had just lost my border collie due to illness and was looking for another dog, I decided to purchase this book on the expectation that it may contain information that would help me in the selection and training of my new dog. It certainly has done just that. I followed the author’s suggestion to read through the working instincts once fairly quickly, then re-read it again – this way one gains an overall picture of what the author’s terminology is all about. Tully Williams has lain down the gauntlet to breeders to breed good dogs with natural ability, to assist farmers in their daily tasks and not to breed only for dog trials. This book is a MUST for every working dog breeder, trainer and farmer. I saw this book advertised in the last newsletter so I thought I would have a look. I am glad I did, it's a wee beaut! This is an OUTSTANDING piece of work in both the quantity; there is barely a wasted sentence, and the quality of the information it contains. An Aussie book, (no Huntaways sorry), it focuses on breeding good quality heading types (although most of the principles apply to any breed of sheepdog). The first seventy odd pages consists mainly of critical assessment of temperament, natural abilities and intelligence, including the good and not so good. This is followed by twenty or so pages devoted to breeding and selection for breeding and likely outcomes from certain choices. I think it is in these two sections that this book excels and stands alone. Some 265 pages long, this is an information dense book, well-written and laid out. It requires careful reading because of the intensity of the information. The remaining pages contain excellent ideas regarding training, training psychology, rearing, stockwork and trials. It includes clear line drawings and a few photographs. The training section is very detailed and focuses considerably on training the trainer and gaining insight in this area. This is high value information for those prepared to take the time to understand it. There is a strongly critical tone throughout this book which is really urging us to take more care in the breeding and handling of these outstanding work mates. It is presented in a solid and informative way by a young but clearly experienced man, of great integrity. In his analytical and passionate approach he is is deeply concerned about the decline in quality of sheepdogs in his own backyard. And it is a very big back yard. I think this book is destined to become a classic in its field. For those of you who value quality books on this subject, BUY ONE NOW!! Working Sheep Dogs is not simply a manual on how to train a working animal, but provides a whole new approach to breeding, training and handling farm dogs. One of the best, most insightful books on working stock dogs I have read! It's been a while since I came across a truly exceptional book on breeding. And this was the last thing I expected from a technical manual on working sheepdogs... This book was a joy to read. Williams' detailed research and fine insights reveal the painstaking obsession of brilliance. Dear Tully, I would like to congratulate you on your book "Working Sheep Dogs" as I found it most educational and informative and wish you every success in improving the standard of the sheep dog. These books and DVD's that you are providing can only help educate people who don't have the experience or knowledge to know what a good dog is. Wishing you every success in your aim to improve the standard of the dogs and their owners. To purchase, click here to visit our online store. Have you read about the amazing abilities of such dogs as Moorlands Georgie, Moorlands Tomie or Cummins Creek Chocker? Now with this DVD, you can see them in real life action! Watch Georgie cast out in hilly country, or show her amazing cover and block and hold while working one sheep. Or see Tomies’ amazing short cover and block and hold working three merinos, or casting out and bringing a mob in. Or Campaspe Bounce casting when only 10 months old. And much more. This DVD features over 2 ½ hours of footage of some of the best allround/casting/mustering dogs in action. It shows them casting out in the hills, casting at young ages, driving sheep away, working mobs, working cattle, and working small numbers. It highlights the extraordinary instincts and intelligence of the well-bred working dog. Most people have never witnessed the extraordinary canine abilities displayed in this DVD – it will open the viewers eyes to things they never thought possible. Yet even this DVD doesn’t show the limits of the capabilities of the best dogs, as you rarely have a video camera with you when you need it. It features high-quality dogs such as Moorlands Georgie, Moorlands Tomie, Cummins Creek Chocker, Campaspe Bounce, Cullens Kiara, Cullens Kirribilli and Campaspe Sue. It is a great companion to the above book. This long-awaited, unique, 4 1/2 hour DVD for the serious breeder is finally here! For less than the price of 2 bags of dog food, this could well be the best investment the serious breeder of working border collies or kelpies could make. There are two secrets to breeding top dogs. The first, and most important, is understanding what makes the top dog, and what is possible. This DVD demonstrates exactly what makes the top dog, the natural instincts required, and shows the abilities that are possible. It is also explains the faults to avoid. It is the first, and only, DVD of its type in the world. No breeder of working dogs can afford to be without it. 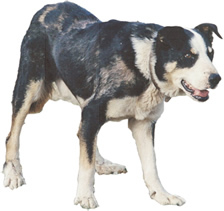 “Natural Ability” utilises film clips of various dogs collected over the years, both border collie and kelpie, and comprehensive voice narration and discussion, to show in graphic form each of the instincts spoken of in the book. It is one thing to read about the instincts, such as ‘short cover’, ‘breakaway break’, ‘width’, ‘casting ability’, ‘drive’, and so on, but another thing to actually see them demonstrated with footage of dogs at work. While the book goes into much more depth of discussion of the instincts, the DVD allows them to be seen. The two complement one another. Well-organised similar to the chapter and subheadings in the book, and with a comprehensive menu system for ease of navigation to each instinct. Running time approximately 4 1/2 hours. This DVD correlates with “Part I – Natural Ability and Selection” of the above book “Working Sheep Dogs”. Very useful DVD for anyone interested in working or breeding top quality working dogs. I will be using this as my guide from now on, when looking for natural instincts and abilities in my future pups. G’day Tully. Many thanks for the DVD. I am working through it a couple of sections per night and am stunned at how good it is! I’ll let you know more when I’m finished but I’ve already picked up a lot. Thank you!…. G’day Tully, I have finished the DVD and am very pleased with what it taught me. It is worth every penny and more, particularly as I can reference it whenever I want. Again, thank you! It’s what I’ve been looking for! Hi Tully, I received your DVD yesterday and can I say it’s what I’ve been looking for! I’ve wasted a lot of money on expensive DVD’s from trialers, which just haven’t been as educational as I wished. I will be looking to see if you have more DVD’s I can learn from, and will watch the one I have again till it sticks well and truly. Thankyou very much for producing such a quality DVD. You have knowledge that needs to be passed on and a great manner to do so. Hi Tully, I just wanted to let you know I received your fantastic DVD and book last week. Your DVD is by far the most in depth discussion on natural ability and instinct I have ever come across! I am thoroughly enjoying it, and it’s so nice to purchase something like this that isn’t over within the hour! I am almost half way through your book and am about ready to start at the beginning again! There is just so much to take in it’s fantastic! The little bit I have read has changed my views so much on how I look at my dogs.